Viola (with Piano Acc.). 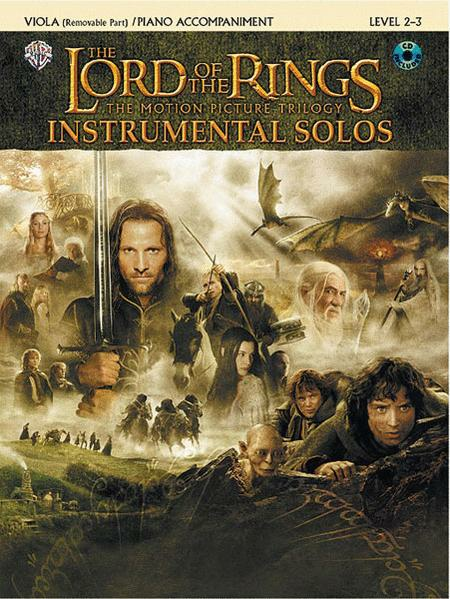 Composed by Howard Shore. Edited by Jeannette DeLisa and Bill Gallifor. Play-Along; SmartMusic; String Series. Movies and Play Along. Instrumental solo/piano book and accompaniment CD. With solo part and piano accompaniment. 80 pages. Alfred Music #00-IFM0413CD. Published by Alfred Music (AP.IFM0413CD). ISBN 0757923305. 9x12 inches. English. Twelve major themes from the blockbuster trilogy. Includes In Dreams, Gollum's Song, Into the West and more. 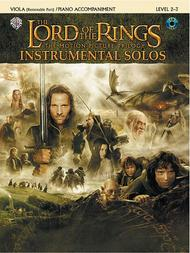 I love LOTR so much and I play Viola and Piano and this is very enjoyable for me! I sent this book to my daughter who just left for college, hoping it would prompt her to continue playing. Se told me she immediately sight-read through the whole book upon receipt and loved it. (She is a huge LOTR fan). become quite complicated with tricky rhythms and alternating time signatures, but it is a pleasant way to build those skills necessary for performing with an orchestra. My daughter has played viola for 1 1/2 yrs. and has quickly caught on to many of the songs thanks to the companion CD. For fans of the Movie score (especially teens) this is a great way to have have fun while working on intonation and technique. A brilliant buy to balance the more serious stuff. 26 of 49 people found this review helpful. With the piano accompaniment parts plus CD of performance with full orchestra and minus one orchestra version, it's definitely excellent value. A great gift for a young viola student.